When Danish musician Murad 'Muri' Mahmoud's acoustic fell to the ground and broke its neck, he endeavoured to create a stand that would clip onto a guitar to make it stand by itself - Standley is the result. 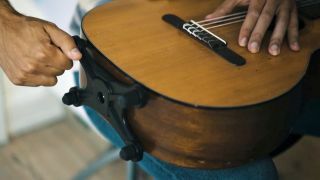 Just launched on Indiegogo, Standley simply clicks onto a guitar's strap button, and its four adjustable rubber-ended feet stand the guitar at 5 degrees from vertical - where the guitar is most stable, apparently. According to the team, Standley has no effect on the sound quality of your guitar and should fit in any guitar bag. A brilliant idea for go-to living room/bedroom acoustics, we reckon, even if you wouldn't stick it on your gigging guitar. Standley is available now from Indiegogo for the early bird price of $39 (approx £32).